Digital Subscriptions > Skeptic > 23.3 > Are Human Rights Natural Rights? HISTORIAN OF SCIENCE MICHAEL SHERMER AND philosopher Massimo Pigliucci have recently disagreed publicly over whether morality and human rights are a part of the natural world. 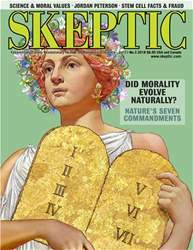 As someone with a professional interest in the science of morality—I’m a sociologist who wrote the 2015 book What Morality Means: An Interdisciplinary Synthesis for the Social Sciences (Palgrave Macmillan)—I want to set aside Massimo’s exasperated hand-waving and insults and consider the possibility that moral realism may be true. Human values, I contend, are a component of the natural world, fully investigable under the purview of an emerging science of cognition and culture. This exchange all started when Michael published a Scientific American column titled “You Kant be Serious” (in the print edition), and “Does the Philosophy of ‘the Greatest Good for the Greatest Number’ Have Any Merit?”2 (in the online version), in which he described the results of a peer reviewed psychology paper3 where researchers had provided evidence of two distinct forms of utilitarianism.